The former Lexington Hotel located on the northwest corner of West Portland Street and North Central Avenue is being transformed into the FOUND:RE Hotel Phoenix, a lifestyle hotel experience which includes custom designs and luxurious amenities inspired by contemporary art and fashion. With 104 rooms managed by Urban Quarters Hospitality, guests will be exposed to an impressive collection of contemporary art and creativity tailored to elevate guests’ experience with every visit. Habitat Metro is bringing FOUND:RE Hotel to life who are also developing the Portland Place condominiums and Portland on the Park condominiums which are expected to open in the fall of 2016. 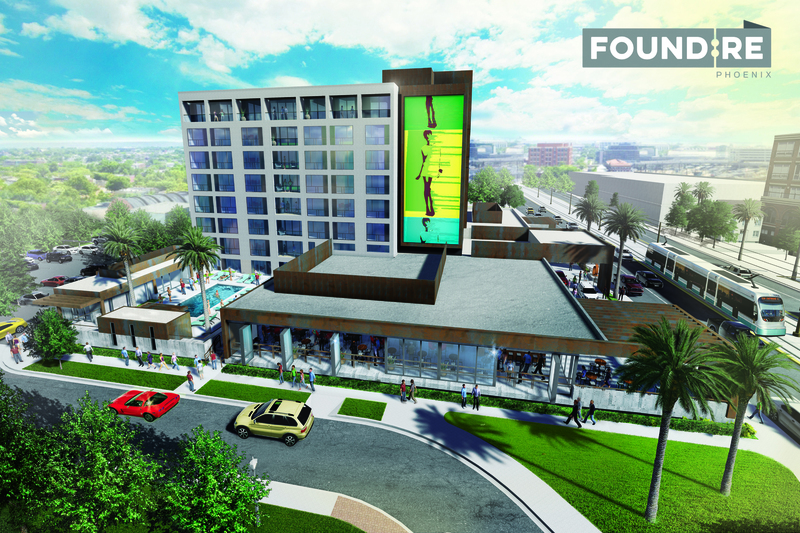 BOND Partners, who are notorious for developing unique lifestyle hotels are teaming up with Habitat Metro to help transform the former Lexington Hotel into a luxurious hotel suited for the heart of Downtown Phoenix. Michael Oleskow, a Cultural Curator, will work to develop a dynamic art component in the modern hotel who will use contemporary art of various mediums by local artists. This collection is expected to complement the decor and design of the hotel and help elevate guests experience when they partake in on-site programs like an art gallery and an exterior avant-garde art display. The FOUND:RE will partner with prolific design partners to help create an industrial, raw design with exposed ceilings and concrete floors. An on-site restaurant will offer a creative menu focused on globally-inspired street food. The grand opening of The FOUND:RE Phoenix is scheduled to be in spring 2016. For more information, visit www.foundrehotels.com.